Catch Speed Rack in Las Vegas This Sunday! The Speed Rack National Tour comes to Las Vegas this Sunday, March 11th. From 3 – 7 PM at the Swingers Club at the Plaza Hotel in Downtown Las Vegas, guests are invited to punches, cocktails, beer, food and fun! 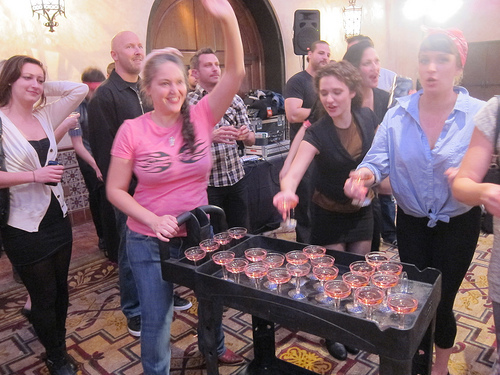 Watch Vegas bartenders compete to raise money for breast cancer research. The winner wins a trip to New York to compete in the finals. Tickets are only $25 at the door or pre-sale online. Guest judges include Tony Abou-Ganim (The Modern Mixologist), chef Kathy Casey, Charlotte Voisey (Portfolio Brand Ambassador – William Grant & Sons) and Audrey Saunders (owner of New York’s Pegu Club). Sponsors include: Absolut vodka, Beefeater gin, Cointreau liqueur, Herradura tequila, Plymouth gin, Famous Grouse scotch, Four Roses Bourbon, Brugal rum, Lillet, Becherovka, Kahlua, Pernod, Macchu Pisco, Chartreuse, Barritt’s Ginger Beer, Perfect Puree, Gran Classico, St-Germain and more! The Tour has swung through New York, Boston, DC/ Philly, San Francisco, Portland/ Seattle, Los Angeles, Denver, Houston/ New Orleans and will be heading to Chicago after Vegas. The finals will be on Thursday, May 10. I love this event and will be there on Sunday! This entry was posted in alcohol tasting, bartenders, cocktail competition, cocktail week, cocktails, contest, events, hot bartenders, the minty, travel and tagged cocktails competition, competition, contest, downtown las vegas, las vegas, lupec, plaza hotel, speed rack, vegas. Bookmark the permalink.